Towards the end of the summer, I went through another French Canadian music phase, this time focused on albums by De Temps Antan, including À l’année, Les habits de papiers, and Consolez-vous. I came across the song “La brune habillée en soie” (The brunette dressed in silk), which I quite liked and also reinforced my impression that there is really only one Québécois song, and all songs express facets of that one ur-song. Actually, the most significant overlap I can detect is between “La brune habillée en soie” and the song “Les larmes aux yeux” (With tears in (one’s) eyes) by Le Vent du Nord. Both are from the point of view of young men who are disappointed in love. Both young men say that if they’d known things weren’t going to work out, “j’aurais pas tout dépensé mon argent” (I wouldn’t have spent all my money) on frivolities (exactly which frivolities varies between the two songs). In both cases, the object of his affections replies (and here again the lyrics are extremely close) that if he spent his money, it was because he wanted to, and how many times had she told him politely to leave because he was wasting his time?! “La brune habillée en soie” also has the line “C’est par un beau dimanche au soir” (It was on a nice Sunday in the evening). In this case, that’s when some people come tell the young man his brunette has changed lovers, but for me the line echoed “Par un dimanche au soir” (One Sunday in the evening) from Le Vent du Nord’s “Vive l’amour” (Yay, love), which is a fair bit more cheerful. I guess everything exciting always happens on Sunday evening. “Les larmes aux yeux” and “La brune habillée en soie” differ in that in the former the young man never seems to have gotten anywhere with the young woman (i.e. it’s all in his head, she’s already committed to a young officer) while in the latter it seems the young man and the young woman were actually together in some sense (though conceivably it could all have been in the young man’s head too, who knows) and she leaves him. That’s probably why the second young man is more bitter at the end of the song. In “Les larmes aux yeux,” he just talks about drinking to heartbreak and saying goodbye with resignation, but “La brune habilleée en soie” ends with the vindictive lines: “Un jour viendra, ta beauté s’en ira / Chère Léona t’épousera qui pourras” (One day your beauty will be gone / Dear Léona, you’ll marry who you can (then)). If you, like me, have spent a lot of time reading hymnals, you might know that most hymns, in addition to having a title, have a tune name that identifies the music, separate from the text. The other day I was playing the Christmas carol “‘Twas in the Moon of Wintertime” (I know, it’s still Advent! But it’s in a minor key, so it’s okay!) from a Presbyterian hymnal and noticed (not for the first time) that the name of the tune was “Une jeune pucelle” (French for “A young maid,” where “maid” has its most archaic sense). (The only song I’ve ever learned with the word “pucelle” in it is “Au chant de l’alouette,” a Québécois song the counselors at Voyageur camp would sing to us after we’d settled down for the night in our tents.) “‘Twas in the Moon of Wintertime” is itself a French Canadian Christmas carol. The original text was written in the 17th century by Jean de Brébeuf, a Jesuit missionary, in Wendat (Huron). The tune is evidently older, though. And finally, if you’re not sick of this, here’s a great track from the album In the Fields in Frost and Snow that’s called “Huron Carol” (another name for “‘Twas in the Moon of Wintertime”). The Huron Carol is really only the instrumental part at the beginning, though; then there are two songs in French, one about starvation and the other about one’s clothes only having one button. I’ve been listening obsessively to Nightingale’s album Three. I learned to play the reel Mariposa (third tune on Track 3) on fiddle and went down a few French/French Canadian music rabbit holes. It never ceases to amaze me how rife French songs are with roses and nightingales. Also, does anyone else think Nightingale’s intro to The Flying Tent (third tune on Track 6) sounds just like the beginning of “Heaven on Their Minds” from Jesus Christ Superstar? A couple of friends of mine are on a Midwestern road trip, and they told me they were listening to Sparkers as they traversed Minnesota in my honor! Not only that, but one of them, a shape note singer, let me know when they got to “gaping graves.” This phrase is a tiny nod to The Sacred Harp buried somewhere in the book, and as far as I can recall this is the first time a shape note singer has told me they found it! I swear this is not a French Canadian music blog. Probably. But today I bring you another recent find, “Les Cousinages” by Genticorum. There’s lots of information about this song in Chantons la chanson by Marc Gagné and Monique Poulin, another book published by L’Université Laval. There, it’s entitled “Le Premier Soir de mes noces” (“The first night of my marriage”), or “Le Mari et le Cousin” (“The Husband and the Cousin”). They recorded the version sung by Rosée Doyon of Beauceville, Beauce. The tune looks different from Genticorum’s, and the text is too (even the nonsense is different!). Astonishingly, they include a phonetic transcription, in the International Phonetic Alphabet, of the words as sung by Rosée, and it’s full of characteristics of Québécois French. There’s this very pretty song I’ve liked for a while called “Le 10 d’avril” (“The 10th of April”) by Les Charbonniers de l’enfer, a Québécois group. It’s about some people sailing to France when a corsair (I didn’t know that was an English word! It means a privateer) fires cannonballs at them, wounding one of the officers. As he’s dying, the crew somehow gets some American officers (conveniently close at hand) to fetch his sweetheart so they can see each other one last time. Don’t ask me how that works (aren’t they out on the ocean? ), but the sweetheart arrives and says she’d exchange all sorts of things (her gold ring, etc.) to heal him. Then, just the other day, I listened to a song called “Le Vingt D’avril” (“The Twentieth of April”) by another Québécois group, Genticorum. And I realized it was a different version of the same text. For one thing, in one version the ship leaves on April 10th and in the other on April 20th… There are also other differences, but some lines are almost identical. The tune is completely different, though, and I have to say I think Les Charbonniers de l’enfer’s is much prettier. Searching for the origins of the text, I found it as “La Mort du colonel” (“The Death of the Colonel”) in Vision d’une société par les chansons de tradition orale à caractère épique et tragique by Conrad Laforte and Monique Jutras, volume 27 in L’Université Laval’s Les archives de folklore. The tune printed in this book is clearly related to the one Les Charbonniers de l’enfer sing. The book gives a couple of different versions of the text, plus lots of variants of individual verses. Among all these variants, the ship alternately leaves on the 12th, the 15th, the 21st, or the 25th of April (none of which match the dates in the two versions above!). Or just in April, generally. Or in May. The main version in the book was sung by one Sévérin Langlois, age 59, on August 25th, 1966 in Cannes-de-Roche, Québec. And the book says that there are 127 versions of this song: 1 from Belgium, 7 from the U.S., 8 from Switzerland (a…land-locked country? ), 26 from France, and 85 from Canada. On a class trip to the Russian enclave in West Hollywood, my roommate bought a bag of frozen chicken-and-pork pelmeni (Russian dumplings that honestly look kind of like tortellini to me–hope that’s not blasphemy). We cooked the first half of the bag in chicken broth, except we didn’t have sufficient chicken broth to make up the amount of liquid the instructions said to use, so I added water. 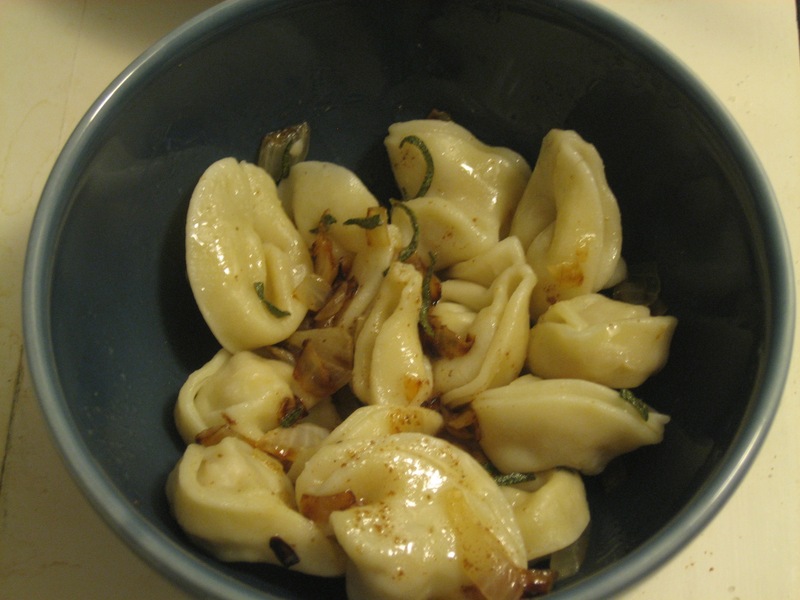 Since one way of eating pelmeni is in soup, like wontons, we tried eating them that way first, but dumplings in watered down chicken broth are really not that good, so we stopped. We read that traditional condiments for pelmeni include butter, sour cream, mustard, vinegar, and tomato sauce, but most of those things didn’t really appeal to me (and we didn’t actually have any tomato sauce). Mustard was the best of the lot, and even that… I don’t know. For the second half of the pelmeni, I wanted to make a sauce, even if it wasn’t a Russian sauce. Inspired by a meal of homemade gnocchi a couple of my college classmates prepared sophomore year, I decided on a sage brown butter sauce. 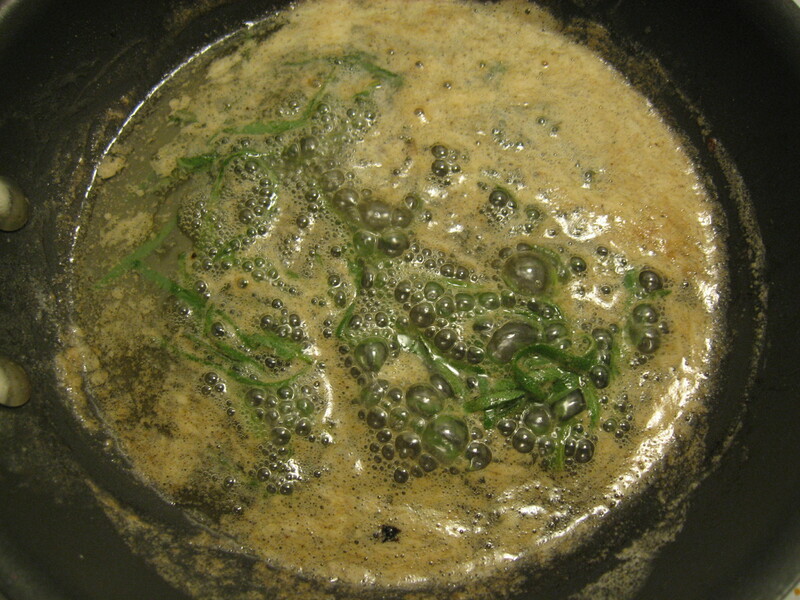 I had never made a brown butter sauce, nor did I know exactly what it was, except that it sounded vaguely classy, the sort of thing they rhapsodize over in BuzzFeed Food lists. Turns out it’s precisely what it sounds like and simple to make. I sautéed some onions in butter to put on the pelmeni as well. Overall, it was a success; I liked the pelmeni better this time around. In other news, I spent several days tracking down a traditional French Canadian song that was stuck in my head but whose words, for the most part, I couldn’t recall. I found it in the end, but I must say, Googling is hard when you don’t know how vocables might be spelled (ridon or ris donc? laridaine or laridène?) or even the lyrics, when some texts try to be more phonetic than others (On prend une platée de crème vs. On prend un’ platée d’crèm’). Anyway, in case you’re curious, the song is variously called “Ridondon,” “Ridondon laridaine,” or “Ris donc la ridée,” and there are recordings by groups with such splendid names as La Vesse du Loup (means Puffball, as in the mushroom), Le Bal à l’huile (The Oil Ball? Like, with dancing? ), and Le Diabl’ dans la Fourche (The Devil in the Pitchfork–am I missing something here?). The French aristocracy of the late baroque era has been characterized as a volatile bunch of scheming manipulators, cutthroat back-stabbers, hedonists, and Libertines…and connoisseurs of every well-developed fine art. Their cynical, and often appalling, proclivities are almost belied by their infatuation with an idealized vision of a mythical Arcadia, populated by innocent nymphs and shepherdesses and their swains. The French embrace of all things pastoral included the hurdy-gurdy, the magnificent droning and singing instrument that had been a fixture in European peasant life since medieval times. Join well-known hurdy-gurdy guest artist Curtis Berak and Les Surprises Baroques for a ramble through this bucolic soundscape, as imagined and realized by such composers as Boismortier, Corrette, Marais, and Rameau. 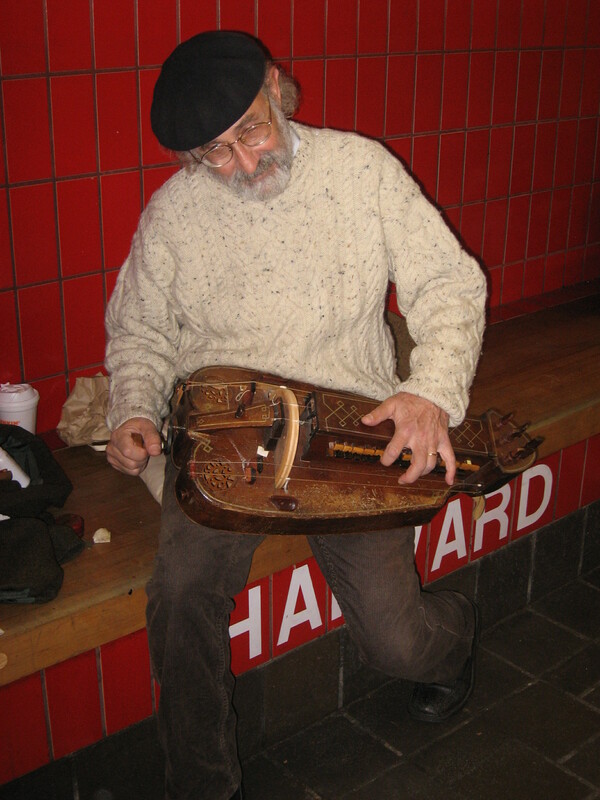 This is not a photo from the concert but a picture I took of a hurdy-gurdy player in the Harvard T Station in October 2010. The concert was wonderful. The musicians played period instruments, including a beautifully painted harpsichord with the phrase “Sic transit gloria mundi” inscribed on the underside of the lid. Most of my exposure to the hurdy-gurdy (or vielle à roue–wheel viol–in French) has actually been through French Canadian traditional music, so I was surprised to learn that in the 18th century the French aristocracy was quite enamored of the hurdy-gurdy, so much so that it was a court instrument and noblewomen learned to play it. Personally, I found it odd to hear it played accompanied by harpsichord or as part of an ensemble that also included strings, recorder, and oboe. Mr. Berak, the guest hurdy-gurdy player, explained how the instrument works. Most of what he said I already knew, but not the part about the buzzing bridge. Basically, one of the drone strings has a bridge (kind of like the bridge of a violin or cello) with one end free, and if you turn the crank that rotates the wheel fast enough, that free end buzzes. You can crank in a way that allows you to add rhythmic buzzes on top of the drones and the melody played with the keys. I think I must have heard that buzz before and assumed it was just the way one of the drone strings was vibrating. In addition to the hurdy-gurdy, another beloved instrument of the 18th century French court was introduced as a surprise after the intermission (I guess that’s why they’re called Les Surprises Baroques?). This was the musette, which is a small bagpipe and thus another instrument with drones. The hurdy-gurdy and musette played a duet, and they were also both featured in other pieces. According to the program, Mr. Berak has the largest collection of antique hurdy-gurdies in the United States (I’m not sure how stiff the competition is, though). Between two pieces, he also brought out two large portraits of aristocratic women posing with their hurdy-gurdies. These were reproductions, but they were still displayed in massive gilt frames. 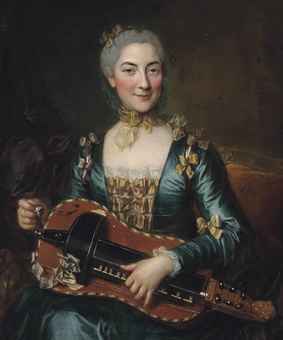 Mr. Berak regaled us with his theory that one of the paintings depicted Maria Leszczyńska, the Polish queen of Louis XV of France, and that the other depicted her daughter, the princess Marie Adélaïde, who was known to have played the hurdy-gurdy. I’m 99% sure this is the purported portrait of Marie Adélaïde a reproduction of which Mr. Berak showed us. Image from here. Furthermore, he suggested that one of the hurdy-gurdies from his own collection, which he showed us, might actually be the very one shown in the portrait of Marie Adélaïde. Not only that, but there was evidence of wax seals having been scraped off the side of the wooden keybox–maybe during the French Revolution! Mr. Berak’s hurdy-gurdy and the one in the painting above did bear a decent resemblance to one another, but frankly I think these appealing stories are fueled more by fanciful speculation than real evidence. That’s not to say they weren’t enthralling! Finally, one of the pieces Les Surprises Baroques performed with hurdy-gurdy was the Concerto Comique no. 3 “Margoton,” by Michel Corrette. Apparently these concertos comiques were meant to follow operas because audiences weren’t ready to go home yet. They were also based on popular songs. The ensemble’s artistic director told us that they had tracked down the text of the song “Margoton,” and she summarized it for us. As she was describing the story, which tells of a young woman who falls into a well and the three horsemen who come riding by and ask what she’ll give them if they rescue her, I realized it was essentially identical to that of another song I know, “La Ziguezon” (“M’en va t’à la fontaine”) by the French Canadian group La Bottine Souriante. No coincidence, I’m sure.